This week I decided to pick two different features from two different parts of the menu. As this party grows I can't wait to be able to have enough link ups to pick a feature from every part of a full meal. 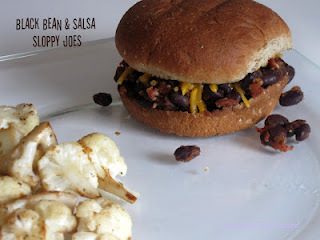 The main course feature for this week is Black Bean & Salsa Sloppy Joes from Searching For Dessert. This is such a great idea and it would be an amazing option for a meatless Monday or for anyone who doesn't eat red meat. This week's dessert feature comes to us from Dorothy at Crazy for Crust. I seriously love her desserts and many of her recipes appear on my "Desserts I Will Make Soon" pinterest board. 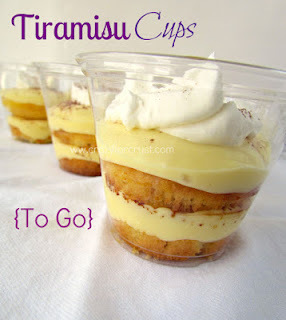 These Tiramisu To Go Cups are no exception and they would be the perfect treat to bring to a party or cookout. So easy to transport and clean up after. You can also check out my newly created pin board for Mealtime Monday Features where I will be pinning the original links to the items featured here each week. Those Tiramasu cups look yummy! Wow those look like some yummy dishes!! Thanks for linking up with us from the friendly followers hop! I am following your blog, and Pinterest too, since I think you pin some great stuff! Hello stopping by from Mingle Monday link party. Really like your site I am just getting started with using coupons and still trying to get the hang of it. I hope that some day I can start saving a good amount of money. Have a great day. I'm in love with the Tiramisu cups! The recipe link up party does sound great!